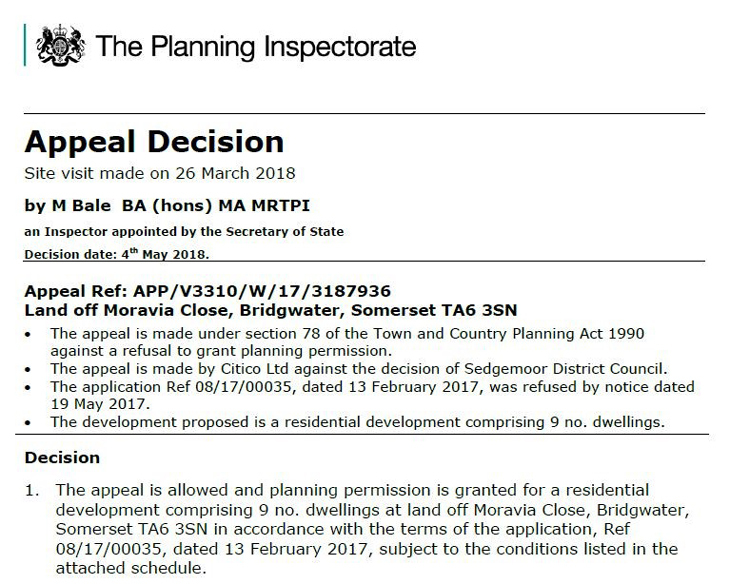 After a long wait for the Planning Inspectorate to issue a decision, it’s fantastic to have won full planning permission at Appeal for 9 new homes in Bridgwater, Somerset! The developer came to us following refusal by Planning Committee, based on alleged impacts on sunlight and daylight received by neighbours, and impact upon the character and appearance of the area. Our team quickly assessed the proposals and pulled apart the documents produced by the Council in order to form robust rebuttals to their arguments and reasons for refusal. Our arguments were compiled in a professional Statement of Case document that was submitted to the Planning Inspectorate. The Planning Inspector reviewed the case and accepted our justification in full – allowing the appeal and granting full planning permission. We also advised our clients that due to the unreasonable behaviour of the Council, we had a strong argument for an application for costs. Rebecca, our Senior Planner created a statement which clearly spelled out the numerous ways in which the LPA acted unreasonably. The Planning Inspector agreed, awarding our client full costs of the appeal from the LPA - meaning our services here didn't cost them a penny! It's excellent to win costs for this type of case because too often Planning Committees are left to make decisions that go completely against sound planning judgement and the advice of experienced professionals. Let's hope that decisions such as this go some way towards making Councillors properly consider their actions before wasting tax payer's money in future! If you’d like us to learn more, or for use to take a look at a project you’re working on, please get in touch.